This morning we reversed back onto the services block at the end of the navigation where the water tank was topped up and the rubbish disposed. Whilst this was being done Jan went to the adjacent Sainsbury’s for some essential supplies. Just under an hour later we were on our way north. The first lock was Catteshall and from a distance it looked like we might have a problem. A working boat was moored immediately in front of it with six National Trust employees wandering around. As we got closer they opened the top gates and waved us into the lock. We’d previously seen coping stones in a barge at the end of the navigation and I thought they must be going to reset them. 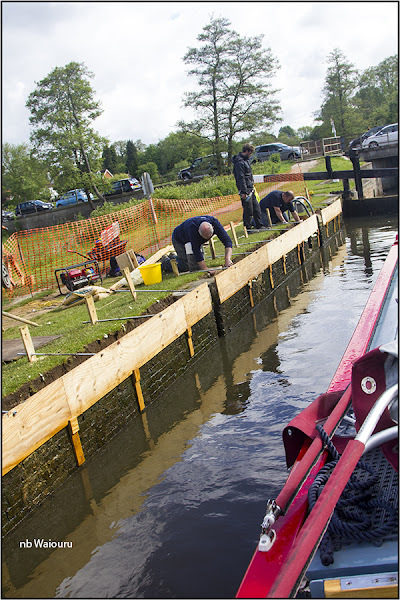 Timber formwork and be fixed to the top of the lock. Then I realised the opposite side now had a new concrete cap. I did wonder why CRT would reset coping stones in order to preserve the original condition of the lock whilst the National Trust didn’t seem to observe the same historical requirements? 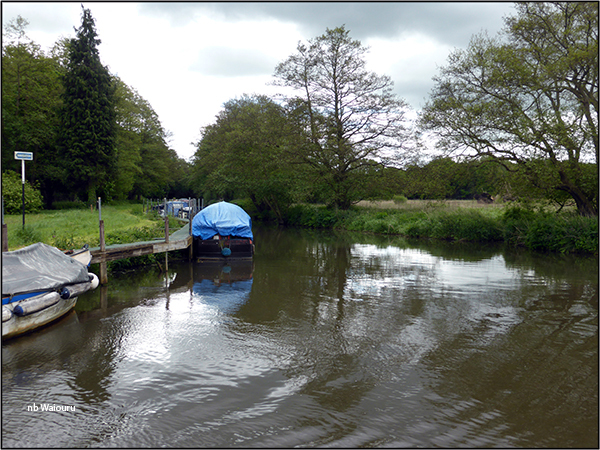 We cruised on passing the entrance to the Wey & Arun Canal which may get restored at some future date. The only part currently in water appears to be this short piece at the junction which is being used for moorings. Shortly thereafter we faced our major concern. After all the recent rain would there be sufficient room under the very low Broadford Bridge. Two days ago we squeezed under with a couple of spare inches. The river had risen slightly but we decided to give it a try. 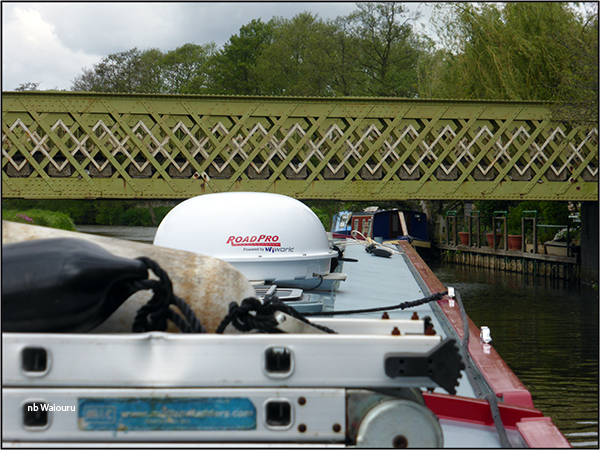 The free space was so small that the sat dome hit the warning bar on the other side of the bridge as we exited. Why don’t they have warning bars on both sides of the bridge? The water between Godalming and Guildford is deep and we made quick progress. 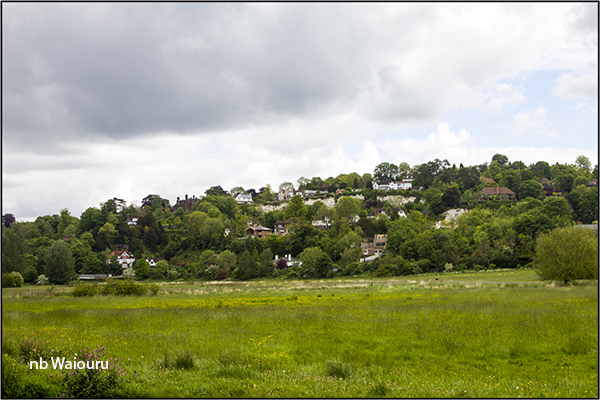 In less than an hour we were on the southern outskirts of Guildford and could see the houses on Quarry Hill. Quarry Hill is also referred to as Castle Hill in some sources .The name Guildford reputedly comes from gold ford which was based on the colour of the sand where the River Wey passed below Quarry Hill. I assume there was also a ford in the same location. 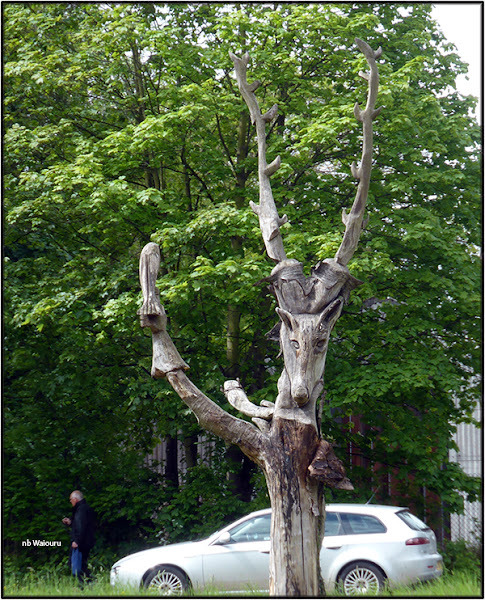 Jan noticed a couple of old dead trees had been subjected to some significant sculpturing on the northern side of the town. We both need to visit a different Specsavers. 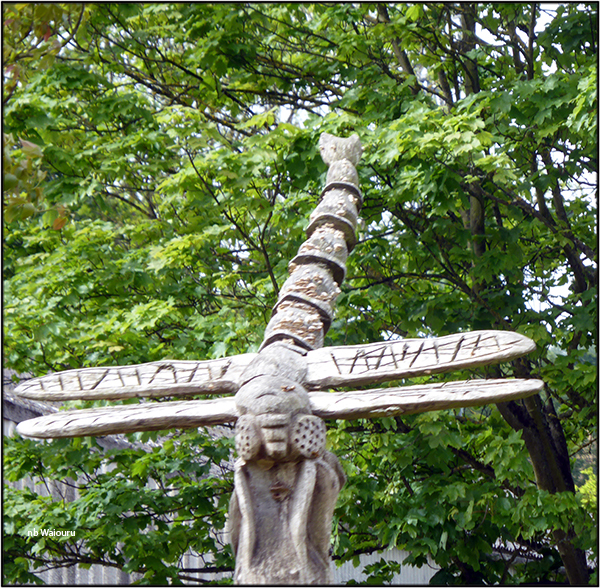 The warning signs on the navigation are so small that our old eyes can’t read the writing until it’s too late. 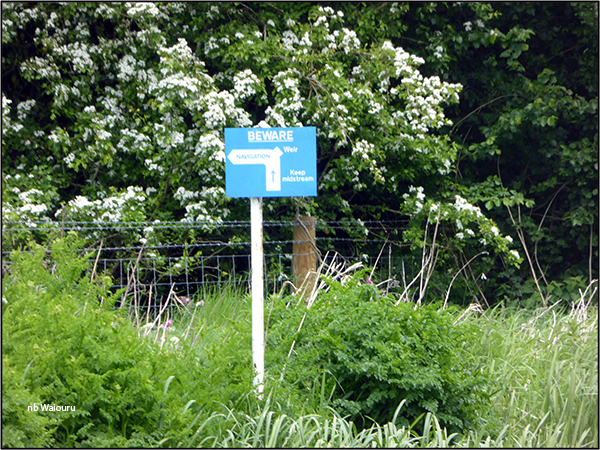 In order to read the sign I had to take Waiouru close to the bank. The sign instructions were to stay in the middle otherwise you will run aground….. we did! 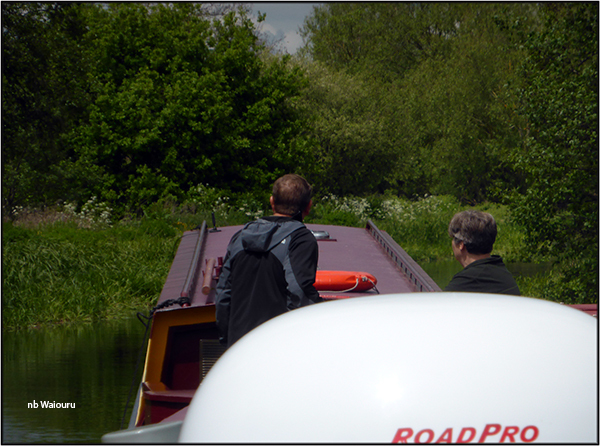 After passing through Bowers Lock we caught up with a very very slow moving hire boat. The steerer couldn’t see over the top of his boat and was zig zagging down the navigation in idle. I was actually able to follow in neutral as Waiouru was pulled along by the suction from his wake. We eventually reached the next lock (Triggs) which we shared. The hire crew had started out two days ago covering the same ground we’d taken 2.5 hours to do. They had unsuccessfully attempted to wind (turn) twice and were hoping to find another winding hole as they only had three days left. The cruising plan went out the window on arrival at Newark Lock. There was a boat in the lock but it only took a glance at the top gates to realise we had a “Huston we have a problem” situation! The top left gate had dropped out of the bottom pivot point and couldn’t be closed. 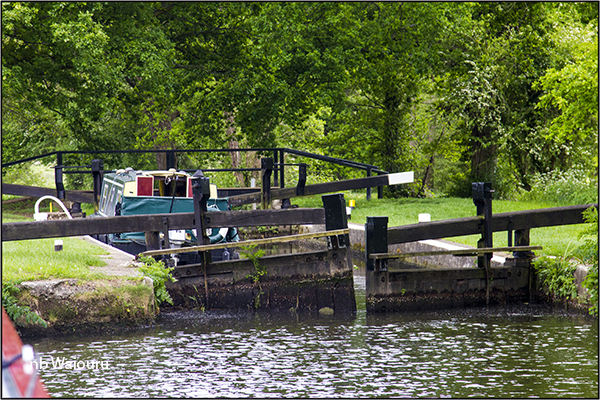 The crew of the small “springer” canal boat hadn’t done it because the top gates were open when they arrived. We’d actually crossed with a fast moving hire boat on the way to the lock. Our guess is the crew probably rammed the gate to make a quicker exit. Every dark cloud has a silver lining. We didn’t think the National Trust would be able to fix the gate before tomorrow so the lock landing would make an excellent overnight mooring. Note: good moorings in the Wey are difficult to find! However within an hour the National Trust Lengthsman Lengthswoman had arrived with a 5ft sash cramp and a car bottle jack. Within 30 minutes she had jacked up the gate beam and popped the gate back into the pivot point. We were impressed! 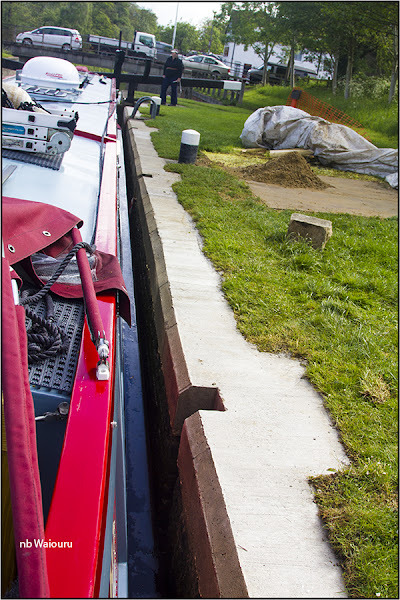 But it meant we had to relinquish our lock landing mooring. 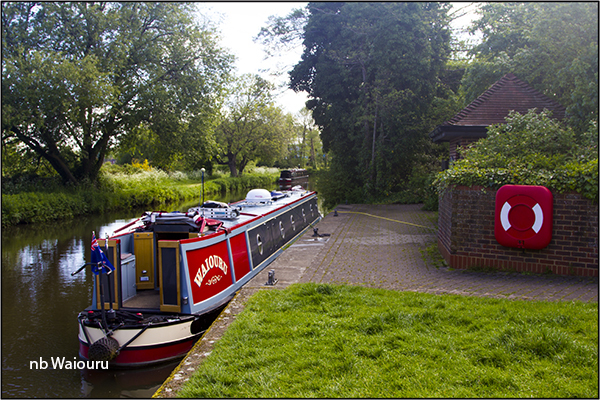 Oh well…… we cruised on to The Anchor pub where we were pleased to find two vacant mooring spots. It’s an easy one day cruise back to the Thames from here and as our license expires on Friday we will probably have a rest day tomorrow. What about doing the whole of the Basingstoke? Then a River Wey "Transit Licence" will allow you back out onto the Thames. We have an appointment in Staines on Monday! There is more of the Wey and Arun restored, but it's a detached section some distance from the junction. Are there any boats on the isolated portion(s)? If only we had more time. I would have enjoyed walking some of the original route!